This tree is probably the rarest on the British List. 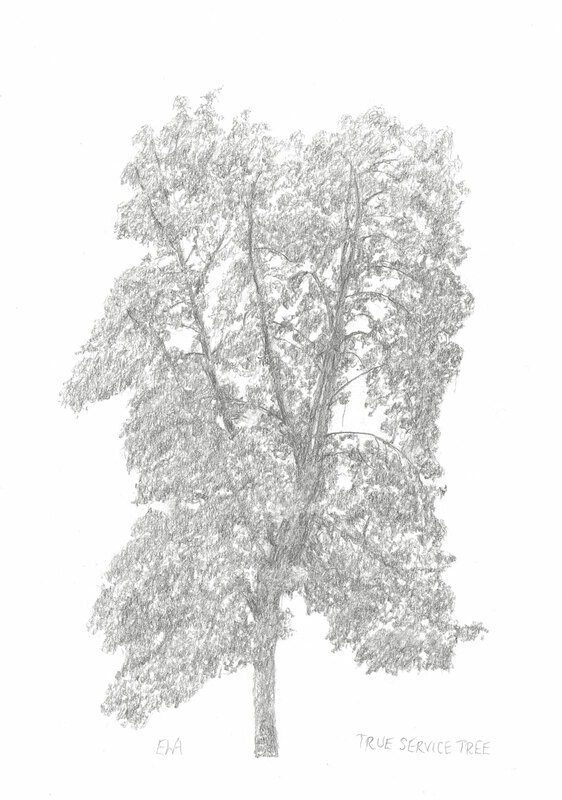 For many years the only known example was a single tree in the Forest of Wyre in Worcestershire. That tree was destroyed by a fire in 1862 but cuttings had been taken from it and one survives as a majestic tree, illustrated here, in the Museum Gardens, York. 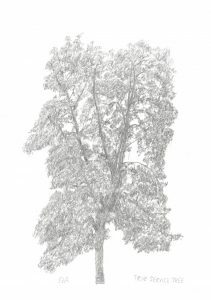 Recently the position of the True Service Tree as a British native tree has been supported by small isolated populations of the species discovered on cliffs in South Wales, on the slopes of the Avon Gorge near Shirehampton, Bristol, and in the upper reaches of the River Camel in Cornwall. A Treasurer was first appointed at York Minster in 1071. Since then, his house has undergone many changes and it is now largely 17th century. At the front, there is a beautiful, award-winning garden in which herbaceous plants are clustered and labelled according to species. The garden is dominated by two mature Ash trees, one on each side, about 30 metres apart. One appears perfectly healthy while the other is in an advanced state of dieback. Ewan drew these trees for the John Innes Open Day to illustrate the ravages of dieback and how two neighbouring trees can be so differently affected. 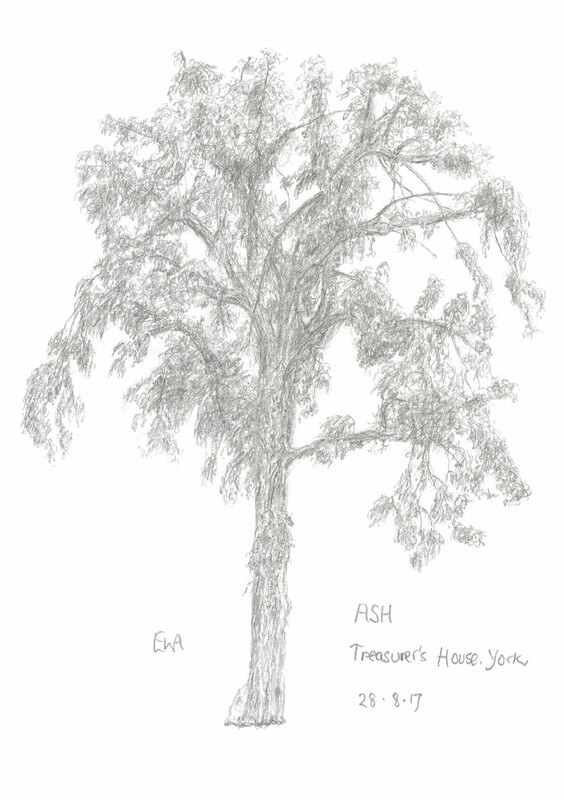 At present, it seems that the west of England is suffering significantly less from Ash Dieback than the east. This may result from a variety of factors including location, genetic characteristics and sources of recolonisation after the Ice Age. 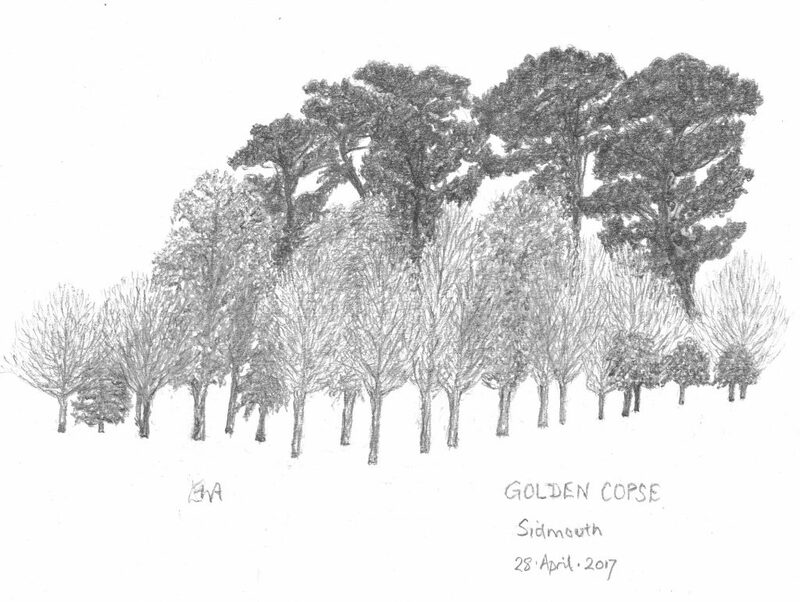 As a measure to facilitate the monitoring of any changes, Ewan has drawn and will continue to draw annually four Ash trees of differing appearance which were planted in the Golden Copse, established in Sidmouth to celebrate the Golden Jubilee of the Queen in 2002. 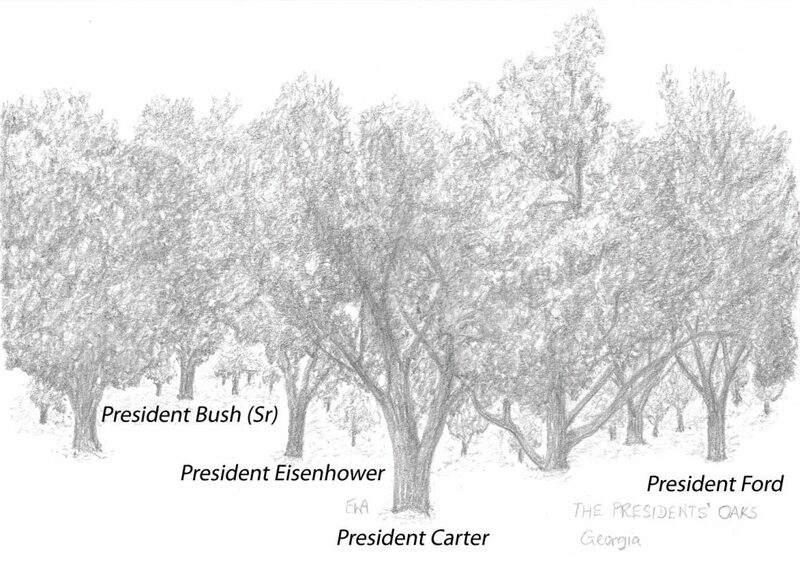 At a place in Georgia where secret governmental meetings are sometimes held, several US Presidents have planted Live Oak Trees to commemorate their visits. The first was Calvin Coolidge in 1928 and the most recent Bill Clinton in 2012. 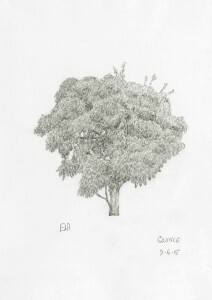 Ewan was allowed to visit in 2016 and was able to sketch the central group of oaks in preparation for completing a picture. The Chinese Persimmon (Diospyros kaki), grown today for Sharon fruit, has been cultivated in China for over 2000 years. However it is now acclaimed worldwide as the tree which survived the atomic bomb detonated over Nagasaki on 9th August 1945. Amidst the devastation, several years later, two small trees emerged 2.5km from the hypocentre. These were nurtured under the guidance of Dr Masayuki Ebinuma, who developed the international “Kaki Tree Project” as a peace gesture. Since 1998, saplings from the two survivors have been sent to many countries including the UK. 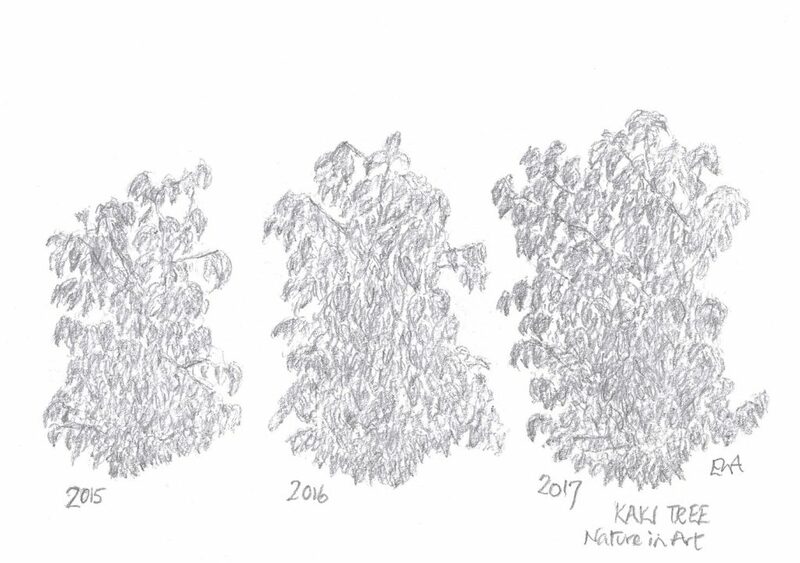 Ewan has drawn the Kaki tree in the gardens of the Nature in Art Gallery and Museum in 2015, 2016 and 2017 to show how the little tree is developing. He is still in awe of a tree with such a history. 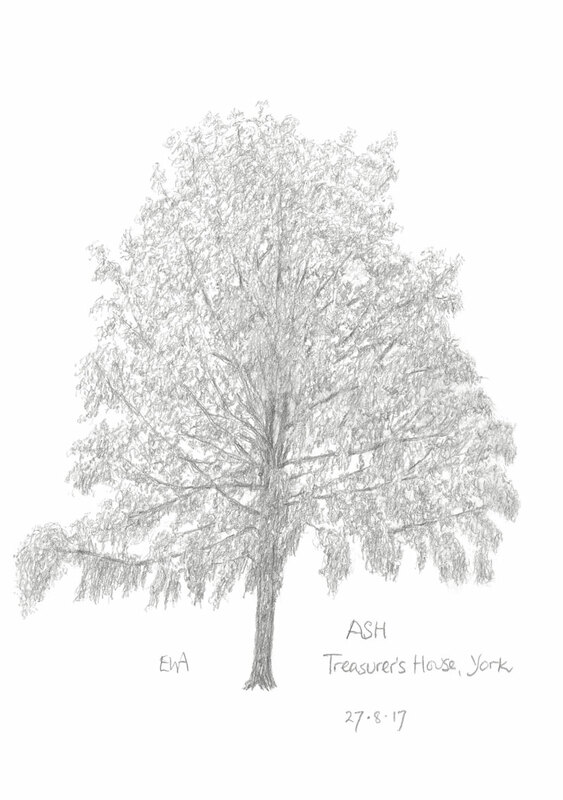 A 200 year old Ash Tree, named Betty, in Ashwellthorpe Wood, Norfolk, has become important in the fight against Chalara fraxinea, the Ash Dieback fungal disease. 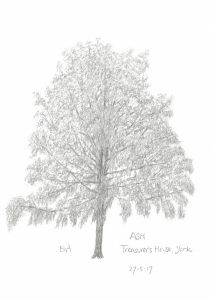 Already there have been over 1,000 reported cases of the disease and Great Britain is set to lose over 50% of its Ash trees. 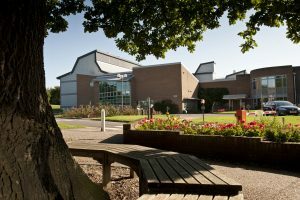 Betty has been found to have a high tolerance to the disease and, using material from her, research on genetic markers is taking place at the John Innes Centre in Norwich. Ewan has drawn Betty and some of her neighbours. 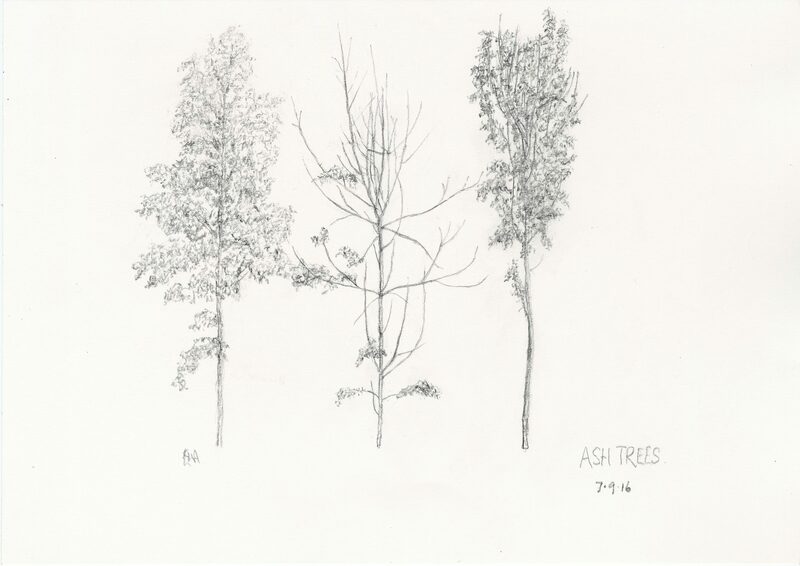 The three trees illustrated grow within a few metres of one another and show the devastating effect of Ash Dieback over very short distances. 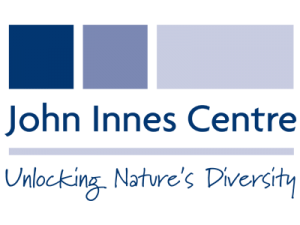 Find out more about the John Innes Centre here. The Museum Gardens were established as a botanic garden by the Yorkshire Philosophical Society within the grounds of St Mary’s Abbey, founded by the Benedictines, which since the Dissolution has become a picturesque set of ruins. 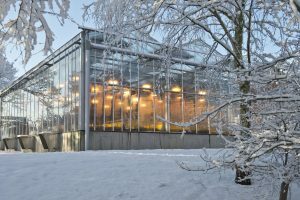 The abiding botanic element in the gardens has been the Arboretum. 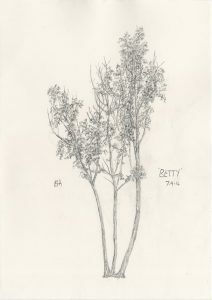 Ewan has drawn some of the rare trees to illustrate a book on the history of the gardens. Twelve of Ewan’s drawings are included in the book, which was officially launched on 6th and 7th November, 2018. Hogarth PJ and Anderson EW. “The most fortunate situation: The Story of York’s Museum Gardens” York: Yorkshire Philosophical Society, 2018. A Callery pear tree was planted by the World Trade Centre in the 1970’s. On 11th of September 2001, as the Twin Towers collapsed, it was smashed, burned and covered in debris. The remains, with broken and torn branches and roots, were recovered in October and transported to the New York Parks Department’s nursery in the Bronx. The tree measured a mere 8 feet in height. 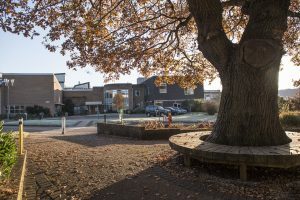 After some nine years of nurture, the Callery pear, now 30 feet high, was returned to Ground Zero on 21st December 2010. Today it is a beautiful tree, spectacular in flower, a fitting memorial to survival, resilience and rebirth. The birthplace of Thomas Gainsborough in Sudbury, Suffolk, is a particularly beautiful house, dating from 1520. Gainsborough was born in 1727, the youngest of nine children, and went on to become one of the greatest landscape painters, the inspiration for Constable and, in 1768, a founder member of the Royal Academy. The house was opened to the public in 1961, as a museum and gallery with a wide selection of Gainsborough’s landscapes and portraits. It is an extraordinarily stimulating setting in which to view the pictures. The house also has an oasis of peace in its walled garden, in which are several fine trees including a 400 year old Black Mulberry, a Quince and a Medlar. 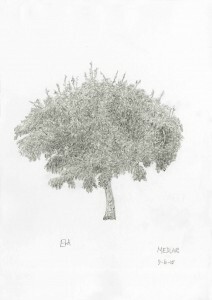 In this memorable place, Ewan has drawn these three trees. 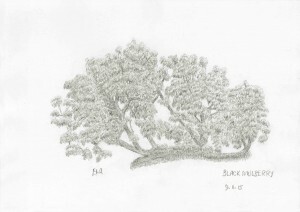 His drawings will be available on various cards at Gainsborough’s House (46, Gainsborough Street, Sudbury, Suffolk CO10 2EU: www.gainsborough.org; tel. 01787 372958 ). Prints may be ordered directly from Ewan.